“Out Of Scythe” isn’t necessarily more guilty of this of-the-moment storytelling than other episodes, and normally I try not to focus too much on the reboot context of this show. Since the pilot, it has been clear that Charmed 2018 is its own entity entirely, borrowing some of the mythology and broad magical strokes of the original series but otherwise shaking most things up, from the age of the central sisters to their powers to the longer, serialized arcs the show is built around. That said, for Charmed 2018 to really work, it should feel more current than it sometimes does. I don’t mean current in the sense of its pop culture references and use of technology. There’s something slightly outdated about Charmed’s aesthetics and sensibilities, which isn’t even necessarily a wholly bad thing. Throwback camp elements on the show have proven to be fun and stylish in its own specific way. But that camp works best when there’s more underneath it, when Charmed taps into something deeper about its approach to character development and emotional storytelling. There are times I wish this show had the budget to give it a look more like Riverdale or Chilling Adventures Of Sabrina. But if it isn’t going to deliver on a stylization front, then the low-budget effects would be easier to swallow if it consistently fired on all cylinders when it comes to the writing. And that just isn’t happening, especially in an episode of “Out Of Scythe” which dabbles in several genre conventions without ever really saying much or delving into something more meaningful. 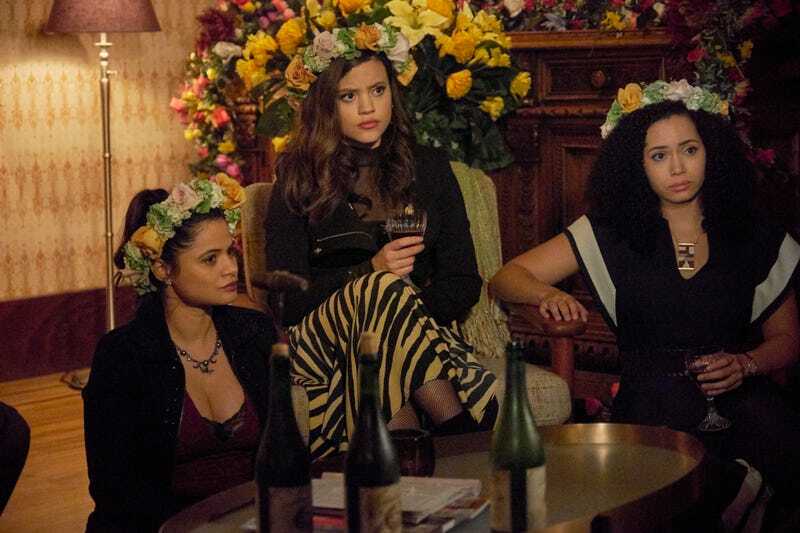 Tropes can be enjoyed when they’re employed well, and Charmed has shown shades of depth before, especially when it really locks in on the relationship dynamics of the show and the way that sisters’ magic has real, human stakes and consequences. But it’s still falling into lazy genre traps, as with the moment when Maggie accidentally reads Parker’s mind and learns that he’s hiding some deep, dark secret. But wouldn’t his thoughts include the actual secret itself and not just the thought “I can’t tell her the truth”? There are essentially two sides to Charmed’s storytelling: the sisters’ demonic issues, and their real-life ones. Charmed might technically balance those worlds, but it doesn’t blend them, and that makes the show feel, at times, disjointed. “Out Of Scythe” is one of those episodes that is especially fractured. It tries to take on the magical issue of the scythe, a key that opens the gates of a demon prison called Tartarus that has been split into three pieces and bestowed upon generational sentinels for protection for many years. Macy, it turns out, triggered an evil plot to piece the scythe back together when she came across the key that the psychic led her to last episode. But “Out Of Scythe” also takes on the human issues of Maggie’s struggle with whether or not to continue college and her burgeoning romance with Parker, Macy’s work issues (her new boss at the lab gives her a leadership position but with the caveat that she fire Galvin), and Mel’s unemployment/procrastination on her grad school thesis. Technically, there are little threads that connect those two sides of the narrative, but there’s only one that’s truly compelling. As it turns out, Parker is the half-demon son of the season’s Big Bad. He’s the shadow demon who Maggie detects some humanity in, and it appears that there’s a lot of pressure on him to carry out his father’s evil scheming. This immediately makes Maggie and Parker’s dynamic more interesting, because as just a young romance, it hasn’t really been cutting it. 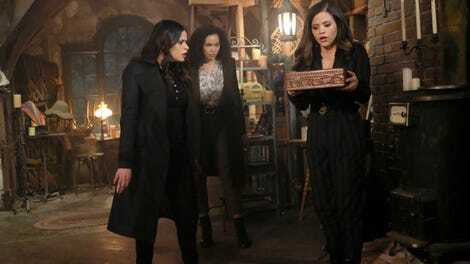 It bridges the two sides of Charmed’s narrative in a genuinely intriguing way, one that’s rife with potential. But that twist aside, “Out Of Scythe” is so divided in its plotlines that it misses out on a lot of opportunities to really entertain. A damn Satyr shows up and gets the whole crew drunk enough to be hungover the next day, and we barely see any of it, the half-man/half-goat instead just serving as pure exposition for the scythe plot. And then on the other side of things, the conflict between Macy and Mel/Maggie that brews as a result of them keeping secrets from each other gets brought to the surface and resolved too quickly, without really letting the full weight of it hit. There are strong elements throughout “Out Of Scythe,” but they are rushed or underdeveloped or both. In many ways, it’s just an information dump episode, one lining up the pieces for an even more seismic event than the hellquakes that rock Hilltowne. Mythology is doled out in clunky dialogue, and sure the plot advances, but it does so a bit robotically. And that by-the-numbers approach to its plotting is just what feels so painfully outdated, like Charmed isn’t sure how to reimagine the tropes it’s working with in a way that feels timely or grounded. The #MeToo hook of its pilot was promising, but there hasn’t really been anything like that since. Charmed is burning through story quickly, and it’s doing so at the expense of more careful character development that could make the story all the more thrilling. Mel marvels at the fact that Maggie isn’t hungover, and Maggie’s response is “I only had four or five glasses of wine.” Freshmen. I know I was kind of hating on the visual aspects of the show, but some of the shadow demon encounter was actually cool. There’s a new demon in town, and she has electrical powers and also hits on Mel at the bar. I’m into it. Niko is being mentioned less and less, and I know that the character has forgotten about Mel, but I hope the show doesn’t forget about her, because Mel’s decision is a much more interesting story choice if it actually has long-term emotional effects. It would be much easier to care about Macy struggling with and ultimately pushing back against her orders to fire Galvin if, again, Galvin were a more fully realized character.